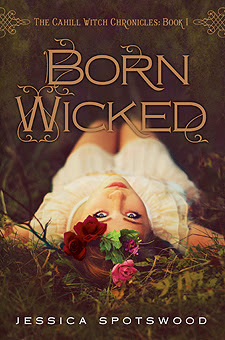 Born Wicked was written by Jessica Spotswood. It is the first book in the Cahill Witch Chronicles and is currently the topic of conversation in the BlogHer Book Club. My least favorite thing about this book? Book 2 is not out yet. Oh, how I hate loving a book and not being able to immediately continue with the story and characters! If you follow my book reviews at all, you might notice that young adult fiction is probably my favorite type of novel. Add in a bit of the paranormal and a little romance and you're pretty much guaranteed to hook me. Born Wicked didn't disappoint. This book is one of those that I'm not quite sure how to review. I just don't want to ruin anything. There were so many little twists and turns. So many times characters surprised me. So many times I found myself holding my breath as I came to the end of a chapter. This book was one of those books that I started reading not having heard a thing about it beyond the book description. I think it was so much better for me because of that. You can be sure as soon as The Cahill Chronicles Book 2 is available I'll have it on pre-order! Disclosure: This is a paid book review for the BlogHer Book Club. All of the thoughts expressed are my own.